We can ID this bird as a male California Quail by its chestnut crown with a black forward-curved plume, white band above eye and around forehead, black chin and throat and throat encircled by white band running from eye to eye. Also, the nape is grey speckled with white, the breast is grey and the belly is buff and white with black scalloping. 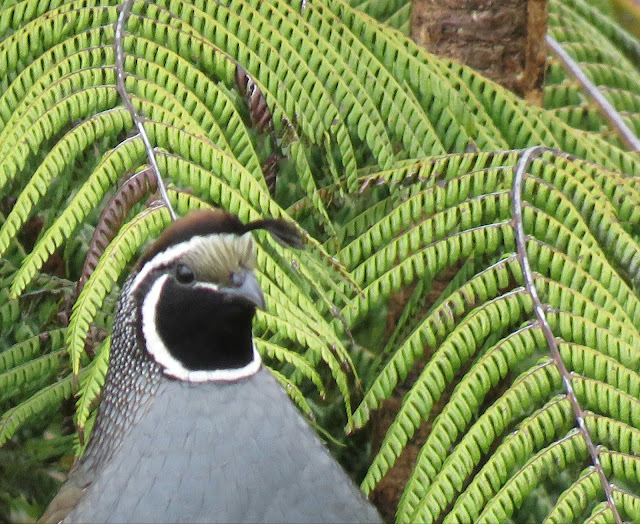 The California Quail is native to North America and was introduced to New Zealand from 1860's onward. The California Quail is a new species to our Photographic Life List, which now stands at 729.